On every page of this site, you have the opportunity to use the search engine to take you directly to an artwork. The search engine appears as a blue box at the bottom right of the page. You can use the search engine to access specific works by typing in one or more of the following: date (e.g. 1999), medium (e.g. 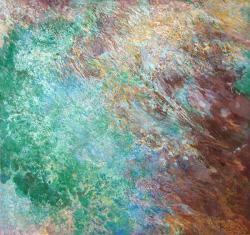 oil on canvas), title (e.g. Tiled Garden) or place (e.g. Spain, Morocco...) You can refine your search by entering more than one of the above (e.g. oil on canvas, 1999) or by entering the catalogue number if known. This will result in a listing of all the works which relate to your criteria. If you wish to make your search more specific, try entering more search criteria. At the bottom of each page you can also access a full listing of John Hubbard's work by clicking on the box List all works chronologically. It is also possible to partition John Hubbard's work into six themes. By entering the keyword of the theme into the search engine below you can view works of that type. The themes are: Cornwall, Dorset, Garden, Morocco, Scotland and Spain. This website contains 75% of John Hubbard's work to date. If you can't find the artwork you are searching for it may be because there is no record. In the past artworks have been sold and never photographed. In some cases, we are still trying to track down owners of specific artworks. If you have information about artworks not featured on this site, please email the artist's estate directly. This site is regularly updated and is currently a representative archive of the artist's work. Do you have an illustration of a work not featured? Not all John Hubbard's work is illustrated here, in many cases it is because there is no visual record of it in the artist's archives. Please go to the Contact page to inform the artist's estate directly of any images, articles or other information which may be of interest. To assist research, the artist has given each artwork a unique catalogue number. Code letters signify the medium, e.g. OC (oil on canvas), OP (oil on paper), D (drawing), or G (graphic). Each artwork is also given a number. Having seen a work and noted the catalogue number, you can then input the catalogue number in the search engine to take you directly to that artwork. All work on this site © the estate of John Hubbard. No image may be reproduced without prior written permission.